Written by Elisabeth Steinmayr, Land tenure consultant, IFAD, and Tenagne Kebede, CBINReMP Focal point at the Bureau of Environmental Protection, Land Administration and Use, Ethiopia. Women’s empowerment is a crucial element of sustainable rural development. Women tend to invest more in education and health to the benefit of all household members. Enabling them to access productive and financial resources has proven to be a good recipe for change. Similarly many development actors now recognize the importance of land tenure security, not only as an end itself but also as a means to strengthen the benefits of other activities. When people have more secure tenure, they can commit to activities with a longer time frame. They are more likely to invest in their land, plant trees and use environmentally sustainable agricultural methods. Moreover tenure security reduces the risk of conflict and can contribute substantially to women's empowerment by acting as a source of collateral. 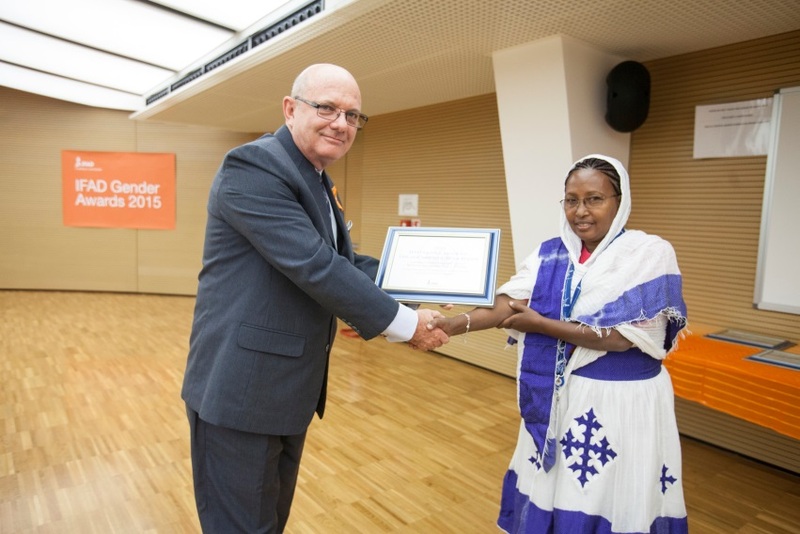 This strong nexus between tenure security and women's empowerment has once again been highlighted during the 2015 IFAD Gender Awards. The award for East and Southern Africa was given to the Community-based Integrated Natural Resource Management Project in Ethiopia (CBINReMP). The project is supporting the issuing of land certificates, which have been given to all women heads of households in the target area. In married households, family land is being registered and certificates are being issued with husband and wife as co-owners. The project is directly benefiting 450,000 households. What this means for the well-being of women and households was vividly explained by Tenagne Kebede, the CBINReMP focal point at the Bureau of Environmental Protection, Land Administration and Use in Ethiopia. Tenagne, who accepted the award on behalf of the CBINReMP, transmitted her enthusiasm for the project during the award ceremony on 25 November and the Special Gender Breakfast the following day. She explained how the project has made a huge difference to many women's lives. Women are now happy to invest in their land and are for example planting perennials and trees and use soil and water conservation methods to increase the productivity of the plots, which enabled them to increase their income. This allows them to buy more food and to raise poultry and cattle – things which have helped them to increase and diversify their family's diet, leading to higher food security. Being respected and having a voice in the community is often linked to owning assets. As women now are landholders, they are joining elders’ and land administration committees or are functioning as arbitrators in land disputes. Needless to say that all of these positive changes have increased women's self-confidence, empowered them on many levels and enables them to serve their communities. When Tenagne is asked about the "how" regarding the great success of CBINReMP, her answer is many times "awareness raising". The project has sensitized communities with regard to women's rights and land, which is the fundamental element for economic empowerment. It has raised awareness about land laws (land proclamation, regulation and procedures), land transaction (including inheritance, donation or gift and rent), and long-term land investments as mentioned above. Activities targeted men and women, both together and separately, in a range of institutions, especially at the grassroots' level, the elders' and land administration committees, and groups of women. The CBINReMP has demonstrated the close link between women's empowerment and land tenure security. The communities in the project area, Tenagne, her colleagues, the Bureau of Environmental Protection, Land Administration and Use and IFAD can be justly proud of their great achievements.